Sandy Straits and Beyond: My Patch! Soon after I moved up here I began thinking how great it would be to get an aerial view of this place. In the past 10 years I have kayaked most of the bays and waterways, walked all the walking tracks within reach, and driven on the more inaccessible tracks with friends in their 4 wheel drive vehicles. However, a flight over the area has still been an unachievable goal! Until the other week, that is! A friend was kind enough to take me and two other friends for a flight to view all our favorite places from the air. Thanks Rod! It was a dream come true!! Rod has a Cessna with 4 seats which he keeps at the little airport just a few blocks away. We waited for a day without too much wind, with nice clear skies, and with a tide high enough to cover all the sand flats and show the bay at its beautiful best! As you can tell I am still enthusing over the experience! I kept my camera up to my eye and pressed the shutter button nearly continuously! I came back with over 400 photos and have managed to cut these down by about 2/3 - and still need to do a lot of editing. Over the next few weeks I want to show the most scenic and recognizable places - along with some bird photos of course! All photos enlarge when clicked on. 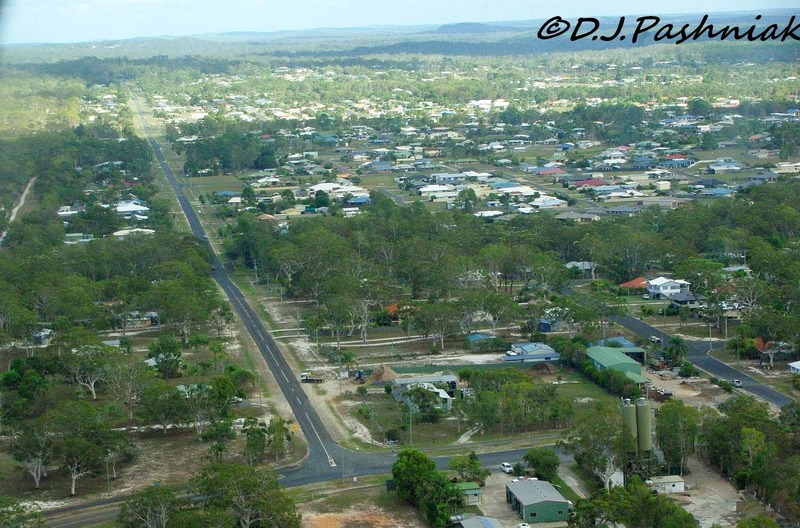 We started with a flight over Cooloola Cove which is the place where my two friends and I all live. This was much better than looking at it from Google Earth! We then flew northwards with the bay on our right (east) and much further east the waters of the ocean. Tin Can Bay was beautiful with the sun glinting on the water. The marina stretches along Schnapper Creek, and Norman Point - which is a favorite fishing and swimming area - is at the eastern point. We continued up the Strait until we reached Inskip Point and the southern end of Fraser Island. 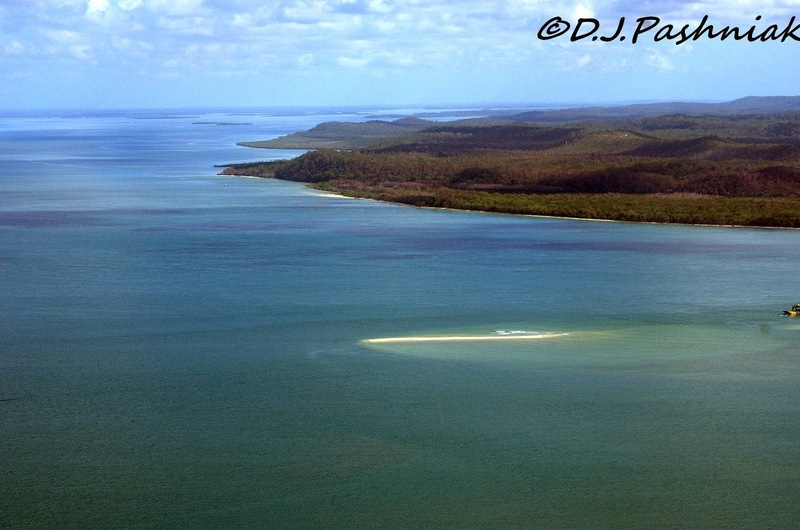 This photo shows the Strait looking north with Fraser Island on the right of the photo. 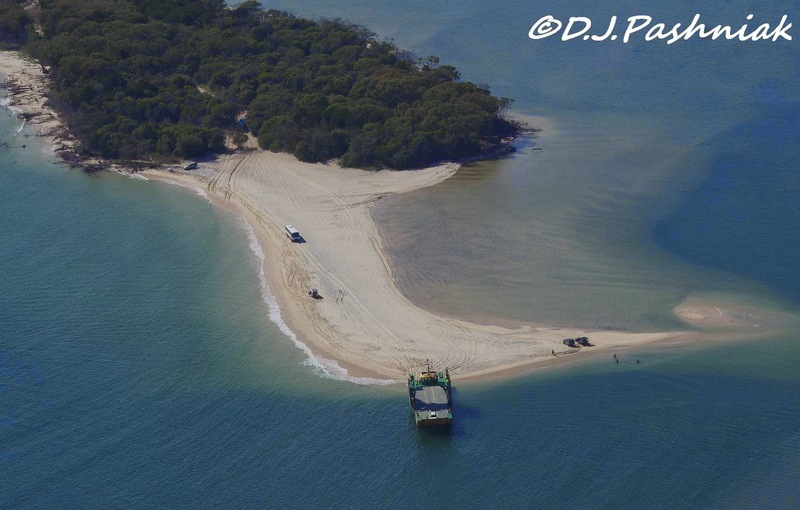 The sand Island just off Inskip Point shows clearly and if you click on the photo to enlarge it you can just see a little bit of one of the barges that takes vehicles over to Fraser Island. I asked for a good view of the sand island - if possible! I had the 70-300 lens on the camera and kept changing this as needed. I am delighted with this view of the island with all the birds standing around the edge. There is quite a large group of pelicans on the northern end of the island - but I can only guess at the rest of the shorebirds standing around. I am sure that there are shorebirds in other photos but when they are standing close to mangrove trees it is hard to be sure which are small trees and which are large birds. The white sand on the island made everything very clear. 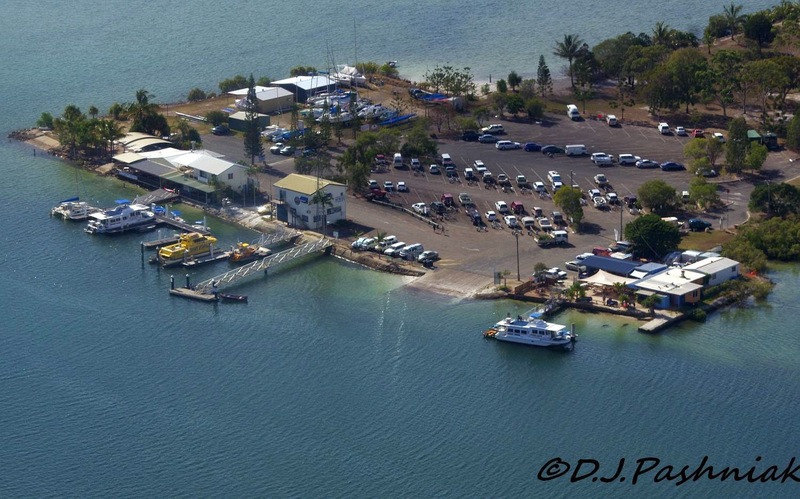 This is Inskip Point and the barge loading vehicles to take over to Fraser Island. There is quite a large tourist bus driving along the point to the barge. Tourist buses to Fraser Island are all 4 wheel drive and high off the sand. 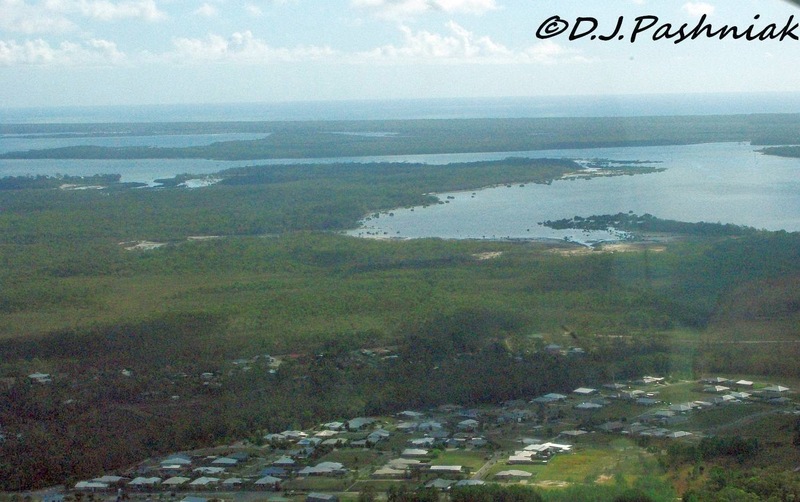 Inskip Point is on a narrow neck of land with Pelican Bay on the bottom of the photo and then the beach stretching along to the town of Rainbow Beach and the colored sand cliffs. If you are not tired of all this scenic detail come back for a continuation next week!! The birds I am including this week are Little Egrets. There seems to be quite a lot around the bay at present. The first photo was taken the other morning when the dark heavy fog clouds were just beginning to lift. The second photo is a Little Egret showing breeding plumes and sharing the tree with a Little Pied Cormorant. Great to see the bay from a different angle. Thanks Neil, it does look very different from up in the air. Thanks for your comment Therese. It was very special to see everything from the air. Oh, these are wonderful, Mick!! I love them all!! Thank you so much for sharing them with us today!! I'm glad, too, that you got to do it!! Have a great week!! Thanks Sylvia. It was as good as I had imagined it would be all these years - well worth the wait! Thanks Carol. It would be hard to take a bad photo when the scenery is this beautiful! Wow, what an opportunity! I love the sand with all the tiny bird "ants" and the egrets in the old dead tree. Wonderful photos. Thanks Cynthia, You certainly get a different perspective from up high - just wish I could have seen more birds - or rather picked them out from the other things around them. How wonderful to fly over an area you know so well and are able to recognise all its nooks and crannies. Hi Fun60 - you are right - the really fun part was recognizing all the little place I know from kayaking around there. Being so high up gave an entirely different perspective on them all. Am so glad you do the Comment thing so one can still view your Post, so much wonderfulness to see, so good to be able to travel back through the Post while I'm babbling away here. Your photos are pure delight to look at. A truly great experience you had and shared with friends. It's wonderful you share them here as well, it's a treat. Oh, so much better to have too many photos, and I do understand those moments when I just keep doing another, and once I stop I'm stunned to see how many I did, but definitely allows one to pick the ones that tell the story best. Your part of Cooloola Cove is still rich with trees, and seems to still have a country feel to it, not overly modernly urabanised. Do hope you have your wish and it continues that way. A friend of mine visits Tin Can regularly, I can see now why she finds going for walks so comfortable. The urban part is very compacted together, providing lots of even, flat walking surfaces. I can see the Dolphins, very wonderful to be able to sit at the cafe and enjoy the dolphins as well, the area looks comfortably not crowded too. The photo showing The Strait is truly relaxingly lovely and I noticed the bit of barge too, totally non-detracting. The sand island photo with the birds is hauntingly lovely. Do the birds get bothered by the light aircraft, or do they take such happenings in their stride now? Another very beautiful scene - Pelican Bay and beyond. I feel the scene reaches out and encourages to come and experience the reality. You seeing the aerial view would have been a whole new insight into the areas you have walked and kayaked I'm sure. Glad you still have more to share. The photos of the Little Egrets is stunning. Love when the sky creates impact like your photo shows. The colour tones are captivating. Seeing different birds together I find enchanting. Your photo of the Little Egret and the Little Pied Cormorant feels lovely to look at. Thanks for all your comments Magda. I think you said you know the Harvey Bay area so you would already know some of the Sandy Strait. It's a very beautiful area and so much to explore in it. I only know this southern end well. 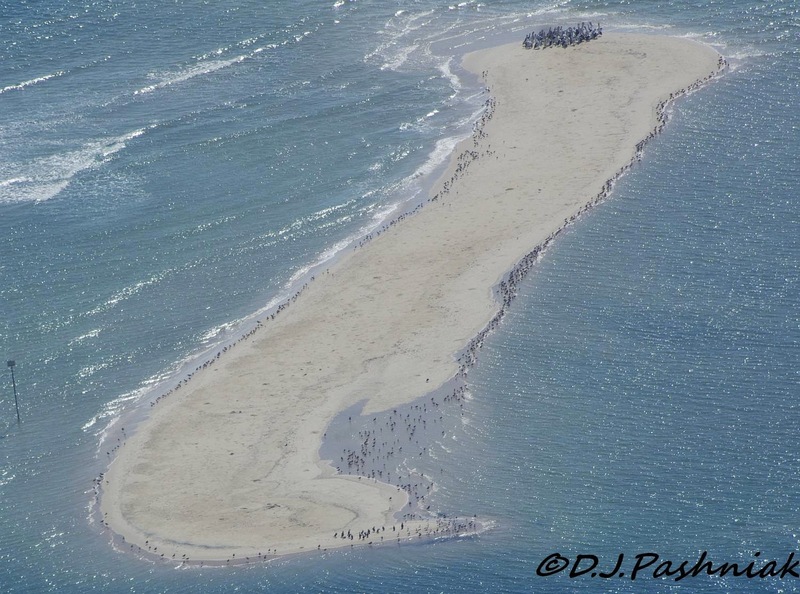 The birds on the sand island were not at all bothered by our plane - we were too high up to be a threat to them. I was using my camera at the full zoom at that stage. How exciting Mick! Terrific shots from the air. You live in a truly beautiful area. The Pelican Bay/Rainbow Beach photo is gorgeous, as is the one of the Egrets against the grey sky! Thanks for your comments Karen. There were so many beautiful scenes to photograph and the best I could do was use a rather general setting and hope it worked out! Some photos did and some unfortunately didn't!! But I am only showing the ones that worked well! There's nothing quite like flying in a small plane rather than a 757 to get the real lowdown on a place. Even better when it's somewhere you know very well. Your location does look fabulous with all that habitat for birding and exploring and I'm wondering if your trip led you to identify a few new places to explore? 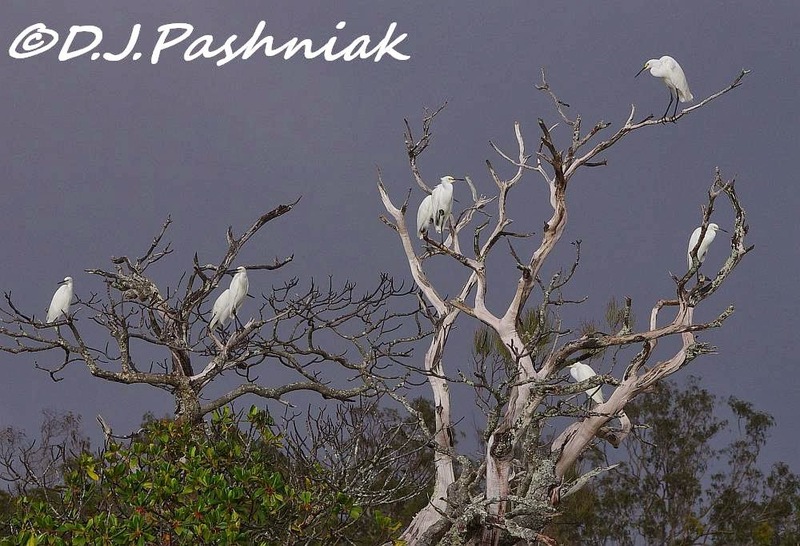 The Little Egrets make for a beautiful scene up in the dead trees.Although I see lots of Little Egrets they don't actually have a breeding colony anyhere near here. Hi Phil, yes definitely there are a few places I now want to have a closer look at - but who knows how accessible they will be by land?? I expect there should be breeding colonies of egrets somewhere near here but I have no idea where. Great pictures - when you see some of the arial shots, you can see why you have so many birds in for patch! And equally you can see how hard it is to find them all! Thanks for commenting Stewart. Lovely post. Interesting to study the details! Thanks Margaret. It's a great area and so many birds to find and photograph. Wow, what an experience! Your area is very beautiful and I look forward to seeing more photos. Thanks Gunilla - lots more photos to come - just have to sort them out first. Your countryside is gorgeous, Mick! Beautiful bird shots! Hi Brian, I think its beautiful and I'm glad my photos can show some of that beauty. Wow, awesome views from the plane ride! I love the sandbar or island with the birds all around. A cool capture of the dolphins, great eye. I found them. Your egrets shots are lovely, well done! Have a happy week! Hi Eileen, glad you liked the photos and could see some of the smaller details. The Pilot of the plane had seen the dolphins as we flew over - but I guess he is used to looking for details from up there - its a bit overwhelming at first. Fabulous adventure! I think it would be wonderful to see 'your own patch' from above! And you caught the dolphins from up there...wow. I think I'd want to frame some of those photos. 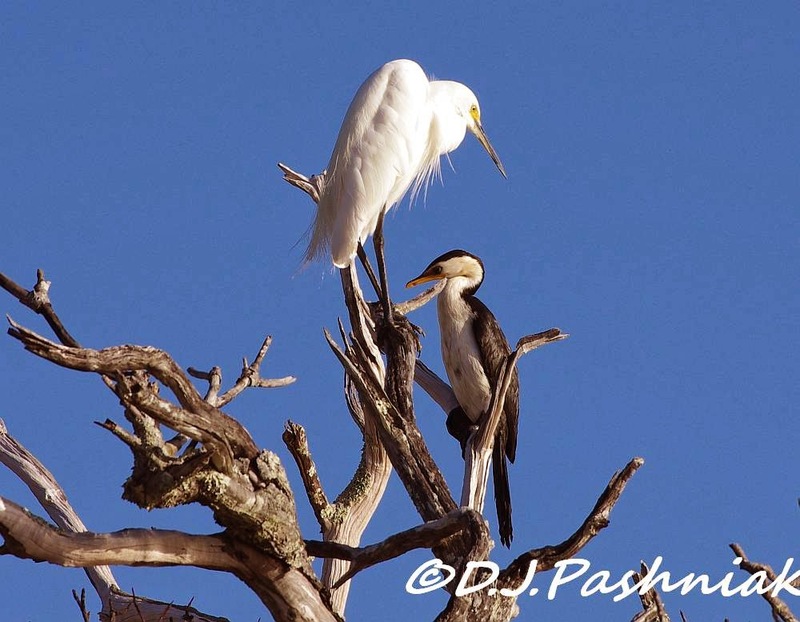 Love the little egrets -- and always think it's special to see to species sharing the same tree. Thanks Sallie for your comments. There was a Silver Gull in the same tree but a little more distant and I didn't manage to get the 3 birds in focus - more practice needed! Thanks for your comment Janet. Thanks for your comments Carole. Like you, I enjoy going over my photos multiple times just to remember the original experience. So much to remember from that flight! Enjoyed this! What an amazing view of the sand island! Thanks Pete, that photo is the one I am happiest for out of all that I took that morning! Hi NF thanks for your comments and I am thrilled that so many of my readers have also said they can see how beautiful this area is. Here's hoping it can be kept without the development that could damage the sensitive environment. Well, Mick, you really had a great opportunity! I would LOVE to do the same around here. It's easy to see why you love this area. It's absolutely stunning! Like you, I would be reviewing the photos over and over just to relive the experience. A really different perspective! Hi Wally, it was well worth waiting 10years to see it like this. Plus after all this time I can recognize all the little nooks and crannies around the bays - and even some of the mangrove trees! When you've kayaked around them so many times they begin to look as familiar as my own back yard. Great shots. Liked seeing the birds around the island from overhead. That's a beautiful view around the bay. The water and its varied hues from up high is gorgeous. I feel like I know Inskip Point from your writings but this put it in a nice perspective. The egrets on all the branches was a lovely shot! Hi Carletta thanks for your comments. 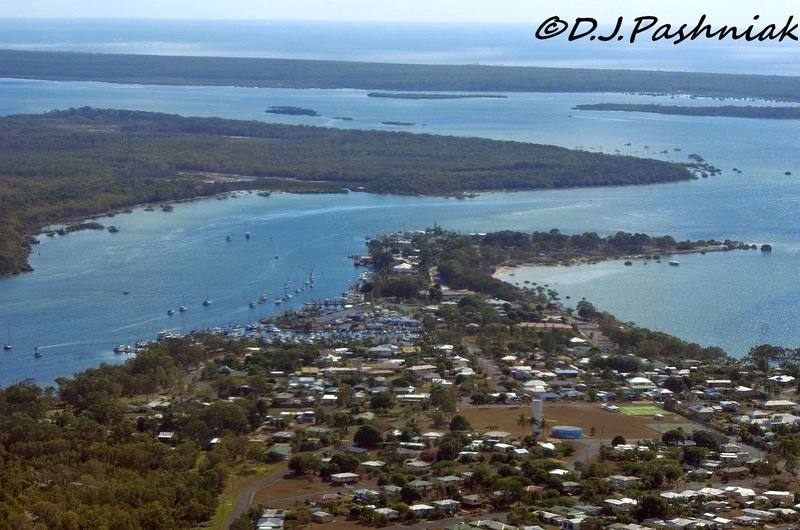 I am so glad that seeing Inskip Point from up high put it in context for you. It is so hard to let others see an area as you personally know it. Oh wow!! Another wonderful and informative post. Your images from the air are wonderful! I would have been continually snapping too. 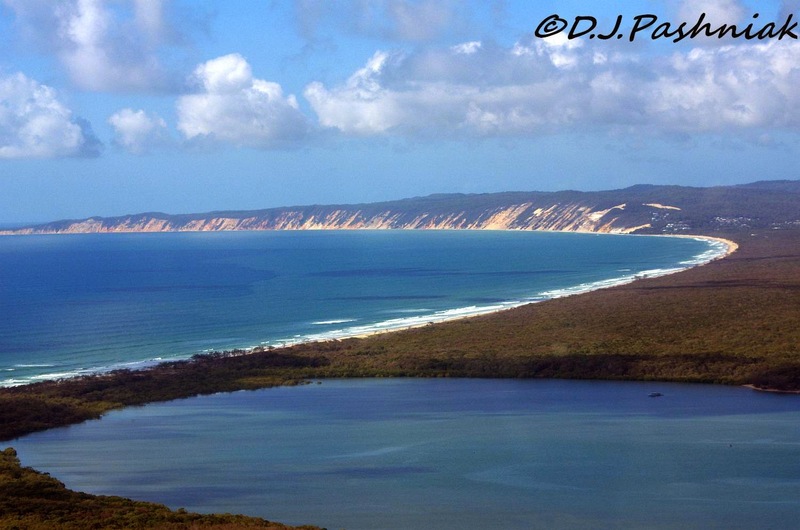 That last landscape of Rainbow Beach and surrounds is stunning! !